One upcoming event on the Melbourne food calendar that I'm looking forward to is the [TOYS] Collective dinner on 7 December, when six young chefs will be putting on an experimental six course degustation at Embrasse with the slightly mysterious, nebulous theme of "Water". The chefs are Nic Poelaert (Embrasse), John Paul Twomey (head chef at Cutler & Co), Aaron Turner (Loam) and Daniel Wilson (Huxtable), with Morgan McGlone (Flinders Inn) and Darren Robertson (The Table Sessions, ex-Tetsuya's) flying down from Sydney. There may still be some tickets left if you're quick. Of the Victorian chefs, the only one whose food I had not yet tried was Daniel Wilson's - so the other week I went to check out Huxtable, the newish Smith Street outfit he runs with Dante Ruaime and Jeff Wong. I went to Huxtable with best-friend-K, that Friday night when torrential rain started bucketing down. 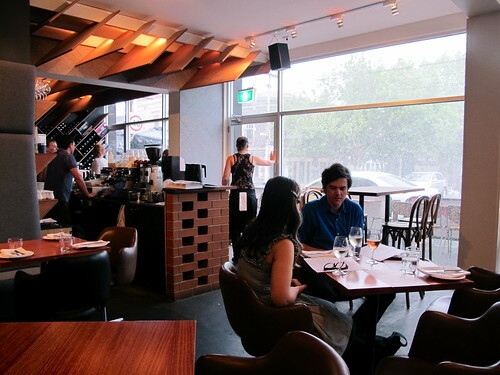 Luckily, by the time the rain started we were safely ensconced within the restaurant drinking Arneis and Grüner Veltliner, enjoying the casual vibe and the late 60s soul music. 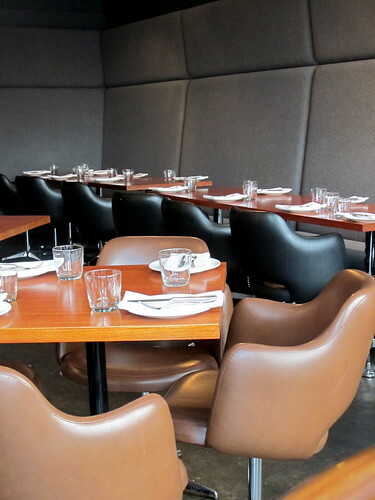 For the diners not sitting in retro brown and black bucket seats at tables, a row of high stools gives those up at the bench a front row view of the open kitchen, à la Cumulus but on a much more intimate scale. Our bubbly, vivacious waitress seated us directly in front of where Dan was plating up, and we had an affable chat to him about TOYS. 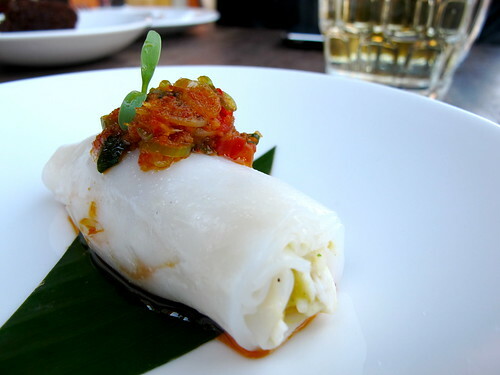 The menu starts with a dozen 'bites', then moves on to shared dishes when are divided up by 'sea', 'land' and 'earth'. It doesn't stick to any one cuisine, instead borrowing from several including Japanese, Thai, Euro bistro, Korean and Middle Eastern. 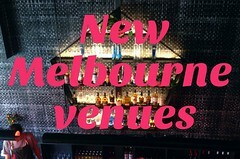 Check out the menu on Huxtable's website, which I commend for being one of the best Melbourne restaurant websites I've seen in ages (hint: it's cleanly and simply designed, with no flash intro, no PDF menus and NO freaking background music). I was under strict instructions from friends that in addition to ordering the pork ribs I *had* to try a jalapeño and cheddar croquette ($3.50). 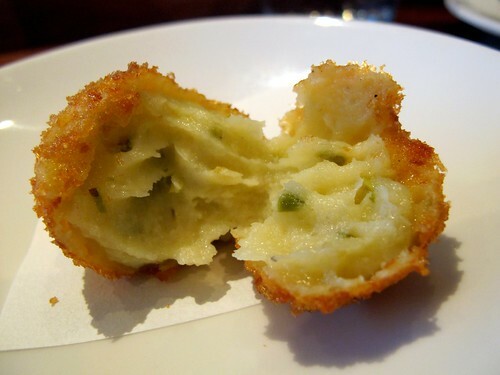 I was pleased to discover that rather than being a mere ball of crumbed fried cheese, the croquette had a hell of a jalapeño kick that made it all worthwhile. There are PO'BOYS on the menu! I can't remember the last time I saw po'boys on a Melbourne menu... quite possibly their presence on the menu is a legacy from Dan's formative cheffing years in the US of A, but that's just a wild supposition on my part. Anyway, the $6.50 po'boy is a must-order in my book (up there with the MoVida Aqui bocadillo de calamares). 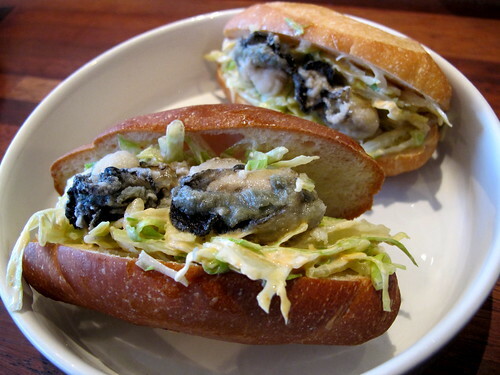 The bread roll contains rice flour crusted fried oysters, iceberg lettuce and Sriracha mayo. O Sriracha, king of chilli sauces. B-f-K selected the crisp filo logs of lamb puttanesca with lemon yoghurt ($5.50 each). 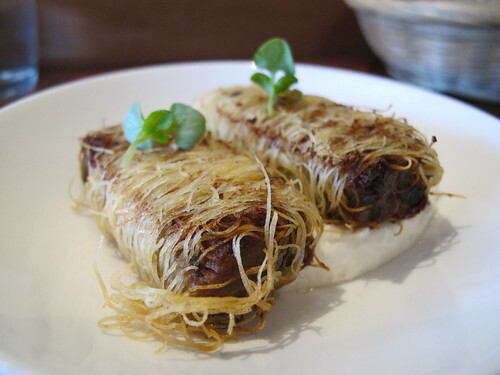 I loved these babies - the lamb had been slow-cooked overnight so it was absolutely falling apart, and the little crunches of filo pastry wisps and the tartness of the yoghurt made the dish just delightful. 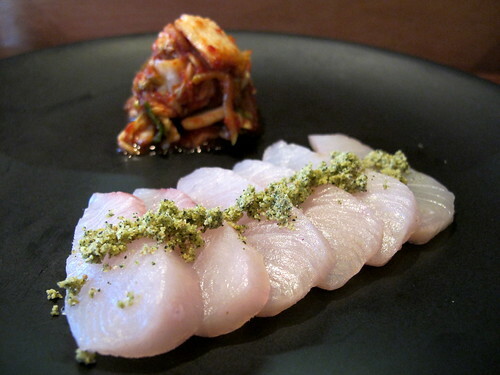 Moving on to the shared dishes, we had a serve of the kingfish sashimi served with pear kimchi ($19). PEAR KIMCHI. As crazy as it sounds on paper I liked it in execution: the sweet, juicy pear diffused the heat of the kimchi in a rather novel way. I also liked the edamame crumb atop the sashimi. 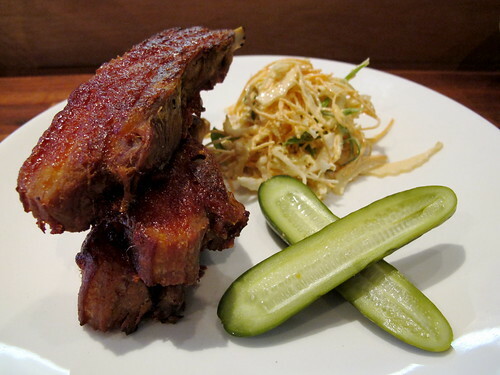 Hot on the heels of the kimchi dish came another with a Korean influence: BBQ pork ribs with spicy slaw and chilli gherkin ($19). Several pork-loving food nuts on Twitter had raved to me about this dish, and with good reason: the spicy pickle cut through the richness of the sticky ribs beautifully, and I could have ordered an entire bowl of that slaw. 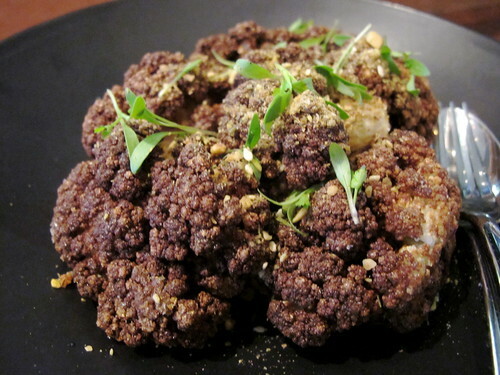 We also enjoyed a serve of Lebanese cauliflower with harissa yoghurt and dukkah ($14). Our waitress tried to tempt us with desserts but by that stage we didn't feel we could manage it - though we oohed and aahed at a passing plate of chocolate mousse sprinkled with vivid magenta granules (freeze dried raspberry from those Kiwi boys at Fresh As, as it turns out). 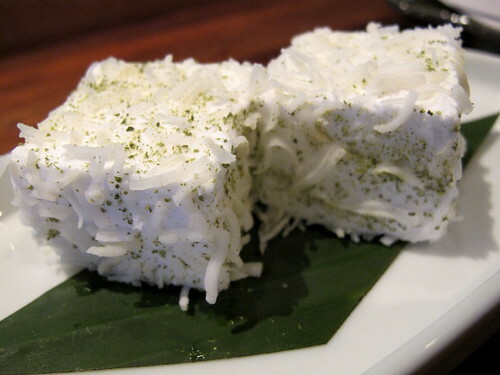 As we were paying our bill, Dan brought us a pair of young coconut marshmallows compliments of the kitchen. I took a bite of one and exclaimed to him (because I am a complete dork), "Tastes like Thailand!" He grinned. "That's the idea!" A week later I returned, spending Saturday afternoon kicking back with Jess over drinks and snacks. 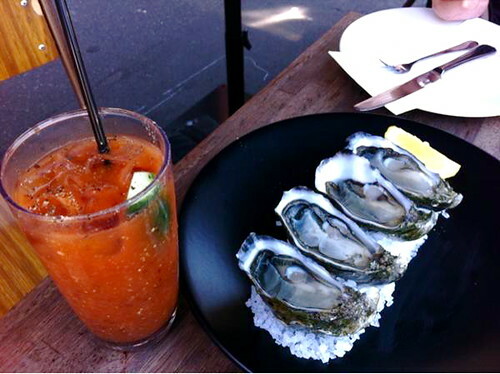 Forgive the dodgy camera phone photo below, I was too distracted by the jalapeño juice in my Bloody Mary to remember to take a proper photo of the Tassie oysters we shared. Jess recommended I try the olive crumbed anchovy mozzarella with smoked tomato ($4.50) and the steamed crab and corn rice noodle with XO chilli ($5.50). I *loved* the flavours of smoked tomato and olive crumb, but felt they masked the anchovy a bit. The noodle was brilliant, especially topped with the handmade XO chilli. 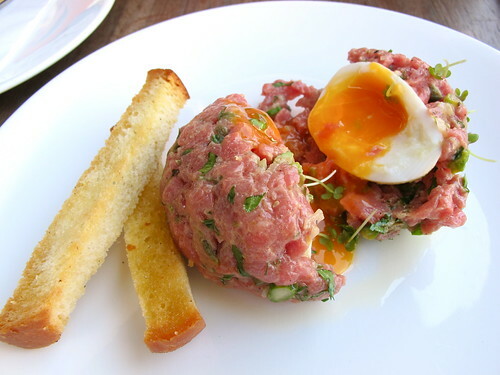 But my favourite dish on my second visit would definitely have to be the veal tartare with a soft boiled egg and soldiers ($21). A dish that would make a vegetarian weep, no doubt, but luckily Jess loves tartare as much as I do. And this tartare is CHOICE. The ball of meat is properly seasoned and the soft boiled egg is embedded within, yielding up its golden yolky treasure after some provocation from the soldiers. Phwoar. 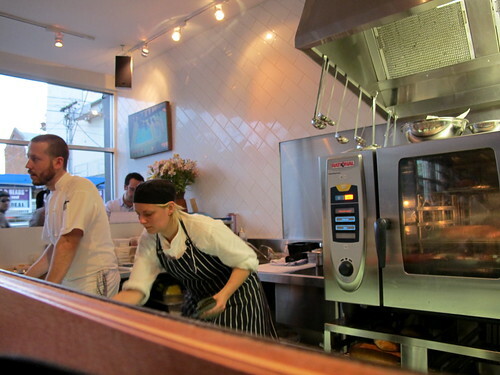 As well as being open for lunch and dinner Tuesday to Sunday, Huxtable also does breakfast/brunch over the weekend. After reading a review on Pepper Salt Sugar Spice, I'm keen to try the French toast with poached rhubarb, Istra bacon and maple syrup. For too long have rhubarb and bacon been kept apart! You MUST try the desserts there. I've not been for breakfast, so that'll be high on the agenda once I'm healed! Damn. Jess has been at me to come with her to Huxtable and I have thus far managed to stay away. I know that once I set foot in the doors I'll have to go every week. Dang. what a cool looking place. I love it when you are inside a place all cozy and it's pouring outside. I want to eat all of those dishes as well, especially the po boy. I have never had one, but it looks very good. 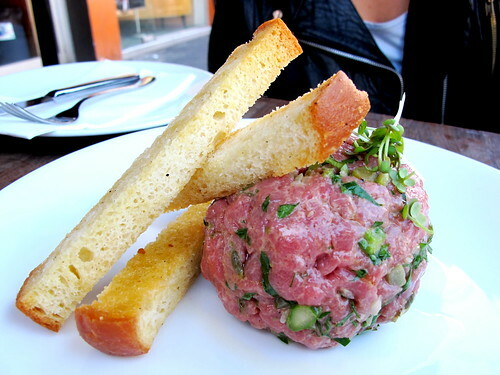 oh how i love tartare!!! i am completely hungry now. What a fabulous review- as usual. NB that tartare would totally make me lose my cool. 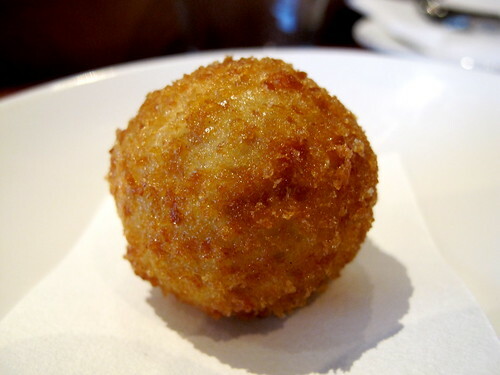 Like a raw scotch egg had a baby with the best bits of a french bistro menu... Gracious me. Must return to Melbourne as soon as physically possible. I want to eat all of those dishes as well, especially the po boy. I have never had one, but it looks very good. Oh my goodness, you got to try so much, what a feast! 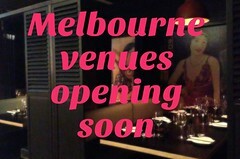 :) I've only ever been there for breakfast but the lunch and dinner options just look sooo sumptuous! Oh wow! Where on earth do you hear about these events??? I want to goooo!!!!!! Thanks so much for the mention! The food looks phenomenal; I will have to visit for dinner sometime. 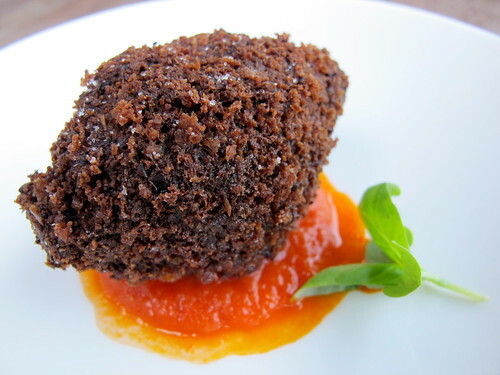 Especially love the sound of that jalapeno croquette and the po boys! The rest of you: get there and try the tartare and po'boy! You won't regret it. Thanks for your lovely words, Tori!